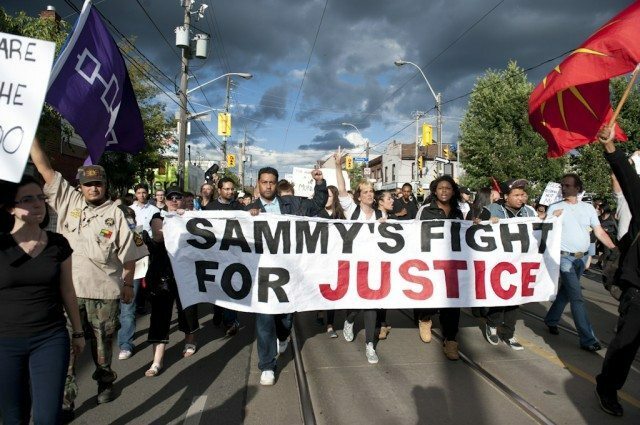 Protesters at a rally following Sammy Yatim’s shooting. Ontario ombudsman André Marin has announced that his office will be conducting a formal investigation into the direction and guidance the Ministry of Community Safety and Correctional Services provides to police services regarding de-escalation of conflicts. The investigation follows the police shooting of Sammy Yatim, an 18 year old who brandished a knife on a TTC streetcar, on July 27. Many believe that the police used excessive force against Yatim—firing at him nine times (including a reported six shots after he had already collapsed on the floor of the streetcar)—who died of his injuries a few minutes later. “I spoke yesterday with the chair of the Toronto Police Services Board,” Marin told reporters today, “and he welcomed my investigation.” Marin expressed his hope that street-level officers would be similarly cooperative. He also asked any members of the public who have information about the shooting to contact his office confidentially. Marin announced that his report will be completed within 6-12 months. CORRECTION: 1:59 PM We originally wrote that Yatim had been shot nine times. This may be true, but has not been confirmed; what we know is that nine shots were fired, not whether all nine hit him.